Patients with suspected inflammatory arthritis can now access rapid assessment and treatment thanks to a new ‘one-stop shop’ Early Arthritis Clinic at Bradford’s St Luke’s Hospital. The service, provided by Bradford Teaching Hospitals NHS Foundation Trust, brings together a wide range of health professionals to offer a unique service which offers fantastic benefits to patients with symptoms of this painful and debilitating condition. Now, only three weeks after referral by their GP, patients who may have inflammatory arthritis can attend the clinic for assessment by a consultant, followed by same-day access to ultrasound, physiotherapy and specialist nurse drug counselling and education. This means that, if needed, patients can have all blood, ultrasound and x-ray tests done during one appointment, instead of separate appointments on different dates as occurred previously. 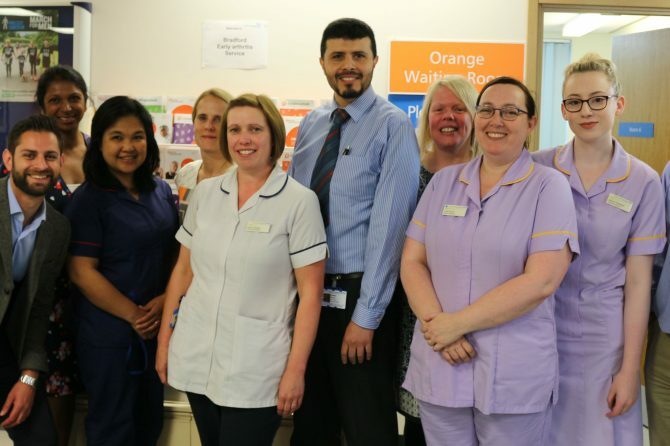 Ahmed Zayat, consultant rheumatologist at the Trust, said: “I’m very excited that we can now offer patients such a state-of-the-art service. Seeing a patient in the Early Arthritis Service for the first time and getting all the necessary tests done means we can really speed up the diagnosis and get them started on treatment. “With the painful symptoms of inflammatory arthritis people can often have to take time off work and suffer both psychologically and physically as they wait weeks for treatment – all things which have a huge impact on their quality of life and also their family. Ahmed said the patient and staff feedback after the first clinic was fantastic, with almost everyone feeling the positive effects of the new service. The one-stop shop clinic, which meets NICE and British Society for Rheumatology (BSR) guidelines, runs once a week and aims to see around 40 new and follow-up patients at each clinic, with potential to expand in future. People should see their GP if they think they have symptoms of rheumatoid arthritis, so they can try to identify the underlying cause. The symptoms vary from person to person. They can come and go, and may change over time, with some people experiencing occasional flare-ups when the condition deteriorates and symptoms become more severe.